To simplify the situation, none can come close when it comes to waste management in Olde Town Arvada. We have been in the business for over a decade and we will use our expertise to create a great experience for our customers. Our goal is to save you time and money on Olde Town Arvada dumpster rentals and you will be treated like a friend through each step of the process. Discount Dumpster is here to make sure that everything goes right with your roll off rental. The customer service representatives are highly trained in the field as we have trained them according to our experiences. There is no job either too simple or too complicated for our company. We can help with whatever waste removal project you are working on, and we strive to make sure everything goes as planned. You can be sure your questions and concerns will be answered, and make sure to alleviate any concerns that may come. Call us today and you will see no one can compete with our company We have everything covered from small DIY home improvement projects to large commercial construction contracts. Our goal is to make sure you are treated as if your problem is our problem. Don’t delay, call today! Our 10 yard container is ideal for cleaning out the garage and attic. You can use the dumpster to dispose of small amounts of household debris. The bin is small in size and can fit practically anywhere. The 12 Yard Dumpster is ideal for small household renovation. Another great use for the dumpster would be small landscaping projects. Like our 10 Yard , our 12 Yard is small and can fit practically anywhere. The 15 Yard Roll Off is useful for small remodeling and renovation projects. The dumpster can hold up to six pickup loads of light demolition materials. The low height of the dumpster makes disposal of debris easier. The 20 Yard is ideal for roofing and light construction projects. Another use for the bin includes small scale demolitions and simply disposing of household junk. 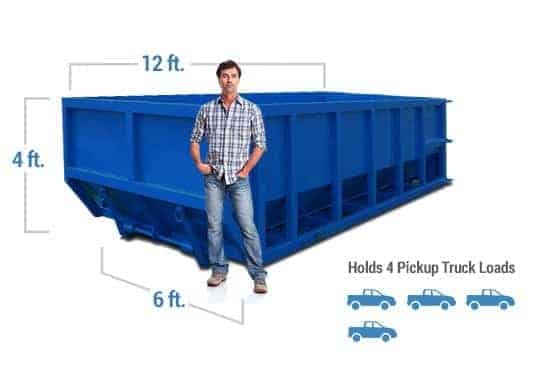 The 20 Yard dumpster holds 8 pickup loads, which can save several trips to the dumpsite. The 30 Yard is a convenient size for large scale waste removal. The dumpster is ideal for home renovations and remodeling. As such the 30 Yard can easily accommodate up to 12 pickup loads of debris. The 40 Yard is ideal for large scale commercial demolition and renovation. 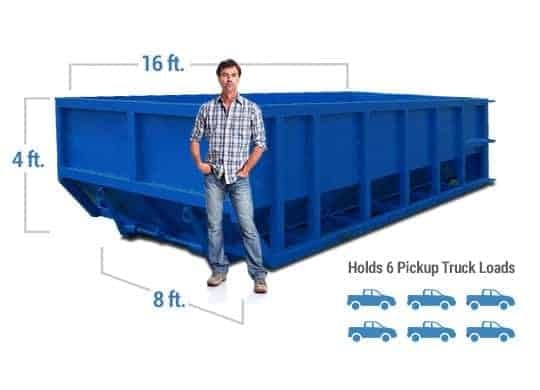 The size of the dumpster allows for the disposal of several tons of debris at once. The 40 Yard holds up to 14 pickup truck loads, making the dumpster perfect for contractors with large scale projects. There are several locations in Olde Town Arvada where we can deliver your roll off dumpster. 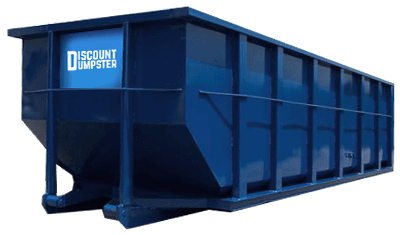 Whether you need it delivered to a private residence or a commercial business, let Discount Dumpster help solve the problem of waste removal. Once you call us, we will walk you step by step through the process of deciding which size will work best for your project. Our customer service reps will make sure that your area is serviceable and that there are no concerns regarding pickup and delivery. When you rent with us, you can be assured you are dealing with some of the best in the business. Call today to rent in Olde Town Arvada! In the past we have rented dumpsters to several different businesses and residences. These include retail shopping centers, construction sites, schools, parks, government buildings, residential homes and apartments, and office parks. All bin sizes are available to homeowners, contractors and businesses that need to dispose of waste on either small or large scale projects. We will deliver the roll off container as quickly as possible to the location of your choosing. Our goal is to save you time and money on waste management. All you have to do is call us today and we will set you up with the right dumpster for your project. Discount Dumpster is here to assist with all of your waste disposal needs. Our customer service representatives are available Monday through Friday to assist with any questions or concerns you may have. We are here to make sure that you are set up with a dumpster that works for you. Our customer service reps are trained to assist you in placement instructions for the container, how to load the container, and on delivery and pickup schedules.